I try to make my weekly snacks on Sunday, so I’m not tempted to buy a candy bar or cookie from the cafeteria in my building. 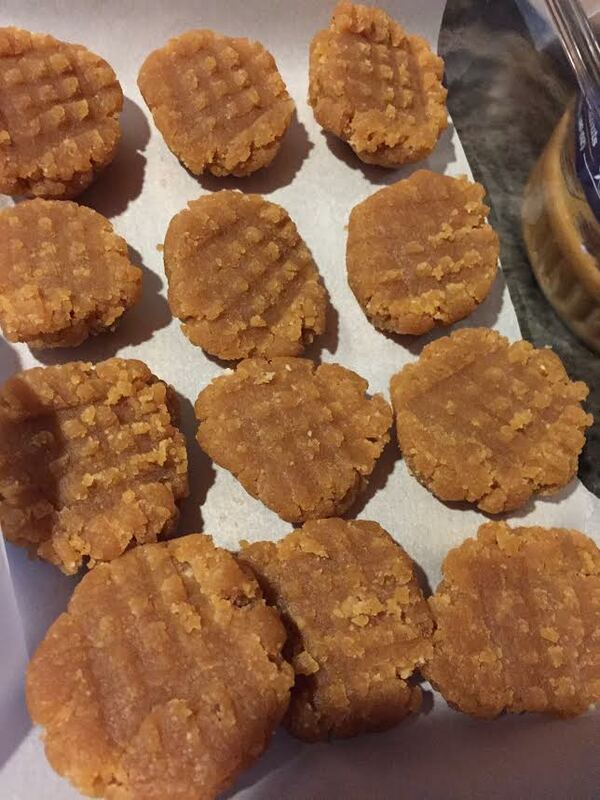 These raw, peanut butter cookies fit my snacking needs perfectly! Line a food storage container with parchment paper. Add all ingredients, except water, to a food processor outfitted with a “S” blade. Pulse several times, then blend for roughly 2 minutes. While blending, a sticky dough should form, and create a dough ball in the processor. If your dough is still mealy, add water, 1 tablespoon at a time, while blending. Once the dough has become sticky or to your desired consistency, stop blending. Using a tablespoon, scoop out some dough and roll between your palms until it creates a firm ball, about the size of a melon ball. Put ball on parchment paper in container, and make crosshatch pattern with a fork, pressing down to your desired thickness. Repeat until all the dough has been made into “cookies”. Enjoy! *Notes: The original recipe called for 1 c. almond meal, and several dates. As dates are not low FODMAP, I omitted them and added coconut flour, coconut oil, shredded coconut, and water to help thicken the dough. Using dates would eliminate the need for extra thickeners. What low FODMAP things do you snack on? How do you plan for your week ahead? These look lovely! I have been on the low fodmap diet for 3 years now and I have found that coconut flour is unfortunately not low fodmap, hopefully you can tolerate it, but be cautious! coconut milk is great in small quantities, again I hope it is OK for you, for many of us it is high fodmap over 1/2 cup. Good luck with it all! Love the posts! Sacha, thanks for your comment. I can luckily tolerate a lot of coconut, including flour and milk, but cannot tolerate dates, which is why I left them out of the recipe (the original called for dates). I think any grain-free flour could be easily substituted in the recipe, and different non-dairy milk or lactose free milk could be used as well. Thanks for the encouragement and support!